NASA’s NEOWISE telescope spotted Comet C/2013 A1 Siding Spring shortly before it is expected to fly by Mars in the fall of this year. In this composite image encompassing four frames, the comet can be seen in multiple positions as it traverses through space relative to the stars in the background. At the time that these pictures were taken, Comet Siding Spring was approximately 175 million miles (1.88 astronomical units) from the Sun. 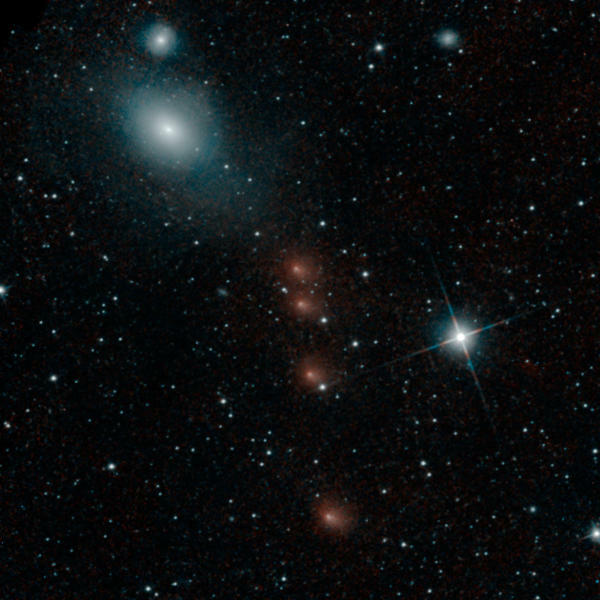 This picture of comet Siding Spring also provides a view of the radio galaxy Fornax A (NGC1316) near the upper right corner. NASA’s Wide-field Infrared Survey Explorer (WISE) took this picture of a comet during its ongoing infrared survey of the whole sky. The Siding Spring comet, also known as C/2007 Q3 was an Aussie discovery and is comprised of a snowball-like mass of ice and dust. It is believed that this comet spent billions of years orbiting in the very cold Oort Cloud but was then knocked out of its old orbit and moved closer to the sun. The heat then warmed the comet and lead to it shedding the ice and dust in a long tail, which trails behind it. 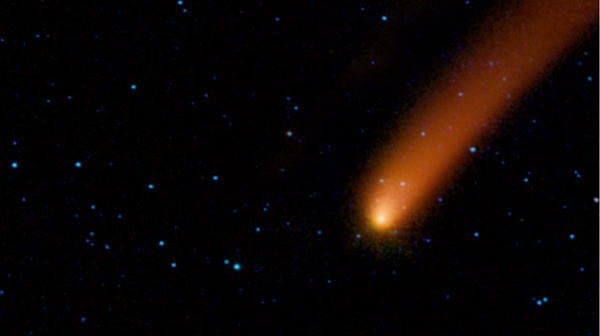 The comet appears red because it is still more than ten times colder than the stars around it.